10 of the best Sgt. Pepper cover versions to test your system | What Hi-Fi? What better way to celebrate Sgt. 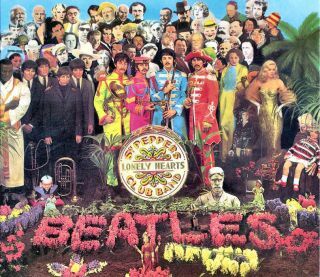 Pepper's golden anniversary than with some of the finest artists ever to have covered this particular Beatles' masterpiece? Having released an album 50 years ago isn't an achievement in and of itself. Having released an album so seminal and consistently influential as The Beatles' Sgt. Pepper's Lonely Hearts Club certainly is. That's why, when we were deciding how best to commemorate its 50th anniversary, we thought what better way than with some of our favourite cover versions? The following list is evidence not only that Sgt. Pepper is veritably an album for musicians as much as it is for music fans, but of its value as an era- and genre-spanning inspiration. The Beatles released Sgt. Pepper on Friday 26th May. On the Sunday they were in the audience at London's Saville Theatre to see Jimi Hendrix open his set with the album's title track. "To think that album had meant so much to him as to actually do it by the Sunday night, three days after the release; I put that down as one of the great honours of my career," says Paul McCartney. Joe Cocker's reworking of With A Little Help From My Friends, with its alternative middle eight chord structure and featuring Jimmy Page on guitar, topped the UK charts in 1968. In 2001, it was inducted into the Grammy Hall of Fame. Elton John said he believed this to be one of the best songs ever written. His version, released as a single in 1974, featured John Lennon on backing vocals under the pseudonym Dr. Winston O'Boogie, with the B-side a cover of One Day (At A Time) from Lennon's album Mind Games. Legendary New Orleans pianist Fats Domino included this cover on his 1968 album Fats Is Back. With its arrangement not seemingly out of place in either his or The Beatles' catalogue, it highlights the band's American influence as much as the influence it clearly had on Fats. Another wildly influential guitarist treading in Hendrix's footsteps and seeking his own inspiration from Sgt. Pepper was Thurston Moore. This rendition of Within You Without You was included on a 1988 compilation of artists covering the whole album, named Sgt. Pepper Knew My Father, and has all the shoegaze and drone hallmarks of a Sonic Youth classic. Another feature from Sgt. Pepper Knew My Father, this cover is as instantly identifiable as Billy Bragg's as Sonic Youth's is theirs. It was released as a single to promote the album, a double A side with Wet Wet Wet's With A Little Help From My Friends. The latter did not make our list. The only instrumental on our list, Jeff Beck's live cover of album closer A Day In The Life needs no lyrics in order to convey all the sorrowful beauty of the original. And so we close with the full album ... twice. First, with Easy Star All-Stars, whose dub reinventions of classic albums sound as if they shouldn't work - see too their OK Computer cover album, Radiodread - but in practice absolutely do. As the name suggests, The Flaming Lips were abetted by numerous artists in creating this Sgt. Pepper tribute: J Mascis, Miley Cyrus, Moby and My Morning Jacket were all involved. The result is psychedelia squared.